Google AdSense is one of the most popular methods for monetizing websites, and despite what you may have heard, it can still be an excellent way to support your content production efforts. In order to get the best results, it’s important to try different advertisement strategies. In this article, I will give you an introduction to AdSense and show you how to get the most out of this ad service. These recommendations are based on my own experience with multiple websites. The AdSense concept is based on the idea of showing advertisements which fit the content of your website as much as possible. For example, if your website is about shoes, you are likely to see shoe-related ads. The AdSense service examines your page content to find out which ads fit the interest of your readers best. The better your site and advertisements match, the better the results will be. AdSense offers multiple ad formats from which website publishers can choose. There is a large range of widely used ad formats, such as skyscrapers, leaderboards and rectangles. These banner formats feature both text ads and graphical ads. You can adjust the font and colors of text ads so they match your website design or to make them stand out more. Graphical ads can be static images, Flash animated banners or modern HTML5 animated banners. Of course you can select mobile banners too. This banner type is designed for display on smaller screens of mobile devices, such as smartphones. If you have a responsive website and would like to make your banners responsive as well, you can choose responsive ads. AdSense will look at the available space within your website layout and automatically display the best banner size. Other than that, AdSense gives you the option to use link units. This banner type is based on text links and its font and colors can be adjusted as well. In order to display Google AdSense banners on your website, you need to apply for the AdSense program first, which can be done through the AdSense website. The review process takes a couple of days. Google will evaluate your website to see whether it complies with the program policies and whether they will allow you as a new AdSense publisher. Please consult the Google AdSense website to learn more about the rules and the registration procedure. As soon as you are enrolled in the program, you can start publishing AdSense ads on your website(s). Using the AdSense administration panel, you can create a new ad. First, enter a name, for example your site name and the ad size (a good idea if you publish multiple sites so it’s easier to identify your ads). Then select the ad size, the ad type (text and/or graphical ads) and adjust the font and color scheme if applicable. For analytics purposes, you can create channels and assign ads to them. You can also determine what you want AdSense to do in case no banners are available, for example showing a blank space, a solid color or a custom backup ad. For almost any website Google has a lot of ads available, so in most cases you won’t see these banner placeholders. After that step the HTML code you need to run ads on your website is displayed. Copy the code and paste it in the appropriate place within your website template. Google AdSense offers extensive statistics on the usage of the advertisements on your website. You can see the number of ad views and ad clicks, for example. Depending on the type of ad, AdSense pays you for either ad impressions (CPI) or ad clicks (CPC). In the next part of this article I will provide you with tips on how to optimize the number of impressions and clicks. One of the most important things when publishing AdSense ads is to use an acceptable number of ads. Google allows up to three banners and three link units on each page. In my opinion, the number of banners you should publish depends on the amount of content on your page. For example, if your webpage includes a lot of content (comparable to a page from a printed newspaper) it’s no problem to display the maximum amount of banners, especially when they are integrated well into the page content. After all, you don’t want to lose visitors due to aggressive ad placements – for example, if the user has to scroll past a couple of banners to reach the ‘real’ content of the webpage. While it may be tempting to maximize your ad performance, it’s important to consider the user experience too. Users visit your website because they are interested in your content, but at the same time you would like to receive the most revenue from those visits. The key to success is to place ads on places where users spend the most time during their visit: next to or within your main content and near the navigation parts. Important locations are for example the main menu and the spot at the end of your page content. By doing so you can give your visitors what they want while also getting what you want. A typical content site consists of a header featuring a logo, a main navigation menu, a content article, and a page footer. In the image below you can see a couple of ad placements that I would suggest in such cases. Which banner size you choose depends on the available space within your website layout. Don’t display a banner as the first element on your webpage. 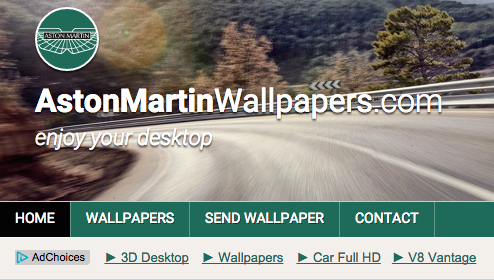 It’s better to display your site header first, for example a logo, a search box and the main menu. If you display a banner as the first element, users will ignore that banner and scroll down automatically. Because the main menu is a very important way to interact with your site, your visitors will use it frequently. As that part of your site receives so much attention, it’s a good idea to display an AdSense banner next to it, for example below the main menu to keep your website header neat and tidy. On some websites it’s profitable to display a horizontal AdSense link unit below the main menu. Link units consist of text links that fit the look and feel of your main menu, which is frequently a horizontal link list as well. 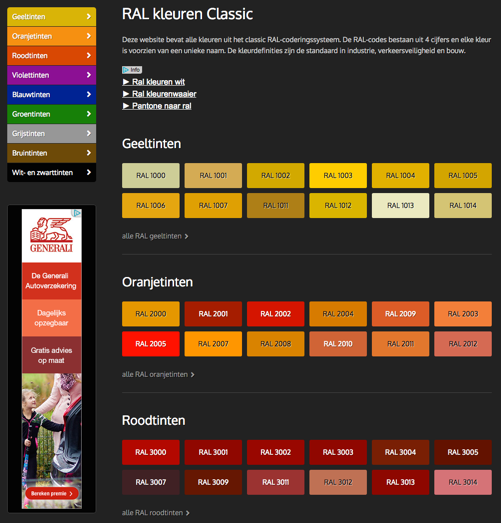 You will receive the best results by adjusting the colors of the link unit so they match your site layout. The space below your horizontal main menu is also a great spot to display a leaderboard banner. This banner will be viewed above the main content of your webpage, so in most cases it will be visible without scrolling (visible above the fold). The user will notice the banner when he scans the webpage to see where the main content starts. When he starts to look at the main content, the leaderboard banner will be within eyesight. Rectangle banners such as the 250×250, 300×250 and 336×280 are also strong performers. Thanks to their size they can be integrated within your webpage content, for example aligned to the upper right corner of your article. On my own websites, I learned that the link unit could be profitable if placed well. As this banner type looks like it is part of the webpage, it can give great results, for example when displaying a link unit at the end of an article. When a user finishes reading an article they enjoyed, it’s likely they will click on one of the links in the link unit to learn more about the same topic. Pay attention to making it seamless, but don’t try to fool the user into thinking the links are a part of the actual website – not only will Google ban you if they look at your page, it doesn’t make for a good experience for your readers and they’ll stop coming back. If your article has a white background, it works well to give the link unit a white border and white background so it blends well in your site layout. Besides that, you can choose from a couple of fonts so the AdSense banners have the same look and feel as your website. This layout strategy applies to other banner sizes as well. 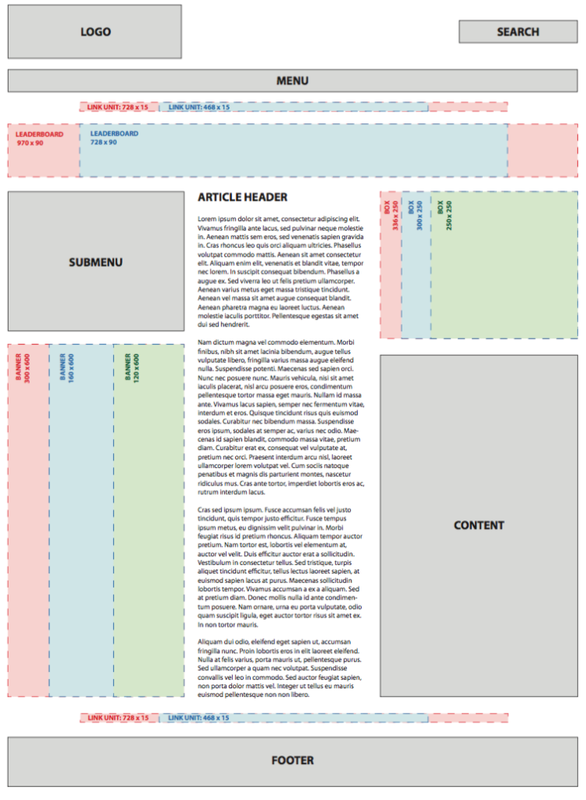 Most websites have a smaller column to the left or right, featuring an overview of the latest or most popular articles, additional content or other messages. Such columns, which are positioned next to the main content, are a great spot for displaying ads, for example vertically oriented banners such as the 120×600, 160×600 and 300×600 skyscrapers. I recommend allowing Google AdSense to display smaller banners in ad spaces that are actually meant for larger banners. 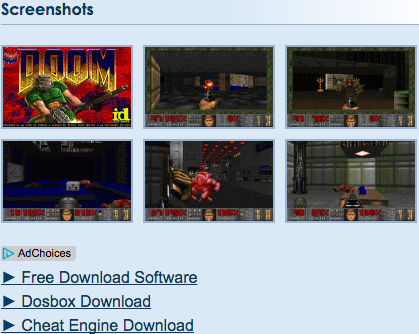 For example, the 336 x 280 ad space can display a 300 x 250 banner as well. The same applies to the 970 x 90 ad space: it can show a 728 x 90 banner without problems. In such cases the smaller banners will be displayed in the center of the ad space so that everything still looks good. By enabling this option you receive banners from a bigger banner pool, meaning higher revenue. As more and more people visit websites using their smartphone, it’s a good idea to display the AdSense mobile banner in the mobile version of your website, for example beneath the mobile navigation menu. In April 2016, Google introduced AdSense’s next generation ads called ‘page-level ads’. These ads are specifically designed for use on mobile websites and show ads automatically in the right format and at the right time. Page-level ads are only shown when they are most valuable; Google determines this for your visitor automatically. 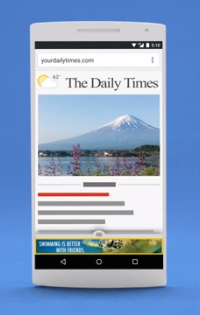 Page-level ads are available as anchor/overlay ads (fixed horizontal banners at the bottom of the screen) and vignette ads (full screen banners). 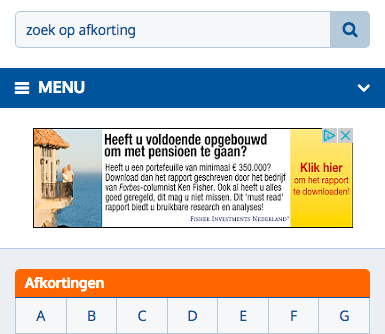 You only have to include a piece of code in the pages where you would like these ads to appear. 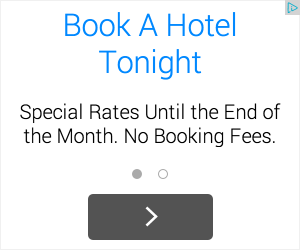 Page-level ads don’t count towards the page ad limit. If your website has a mobile version, I recommend to use at least the anchor/overlay ad and to try the performance of vignette ads. Be sure to opt-in for displaying both text and graphical ads when creating new AdSense banners. By doing so, you increase the available ad inventory. Most text ads are CPC based (paid on a cost-per-click basis) and most graphical ads are CPM (paid on cost-per-impression). AdSense has an advanced system that determines which ads will give you the highest earnings and by enabling both text and image ads, you will receive the best results. By default gambling related ads are turned off by Google AdSense. If your website is targeted at adults, you can change this setting so gambling ads may appear in your site. This can be profitable for certain types of website, and you will have to make that determination yourself. Log into your AdSense account, go to ‘Allow & block ads’, choose your site in the list to the left and click on the tab ‘Sensitive categories’. At the bottom of that page, you can allow gambling related ads. It’s important to include interesting keywords in the first paragraphs of your webpage content. When the webpage loads and the AdSense banners are requested, Google scans your webpage and determines which ads fit your content best. Google thinks the first paragraphs on your webpage are the most important and that’s why the ads will be based on the keywords in those paragraphs as much as possible. When you are set up to receive banners that fit your content and target audience as well as possible, you increase your revenue while delivering more value to readers. Let’s say you have three AdSense banners on your webpage. Using AdSense, you can see which of those banners has the highest click-through-rate (CTR). It’s a good idea to load the banner with the highest CTR first. The best performing banner should come first in the HTML structure of your page, even if it’s displayed in the middle or at the bottom of the page. The reason behind this? When a page is loaded and the AdSense banners are requested, AdSense fills the first banner with the highest paying ads. As all websites are different, it’s important to figure out which ad strategy works best in your case. I recommend trying different banner formats, ad placements, fonts and colors. Even small changes such as color adjustments can make a big difference in how a banner performs. AdSense helps you do these kind of experiments. Log in with your AdSense account and go to My ads > Content > Experiments for more information. If you want to read more about Google AdSense and how to optimize your website revenue, I suggest you check out the official Google AdSense blog called Inside AdSense. On the official Google AdSense YouTube channel you’ll also find videos with interesting optimization tips. Google AdSense is still a great way to monetize websites. AdSense provides a wide range of banner formats from which webmasters can choose. It’s important to integrate AdSense banners into your website layout as seamlessly as possible; ad placement shouldn’t be an afterthought when designing commercial websites. The key to success is to place ads in the places where users spend the most time during their visit: next to or within your main content and near the navigation areas. Be sure to experiment a lot to find out which ad strategy works best in your case. Together with his twin brother he runs a web agency in The Netherlands called Whirlwind Internet. Besides client projects Jorrit likes to work on private web sites and HTML5 applications in order to create online experiences for users to enjoy and to learn new things in the ever changing world of web development.